In the latest refresh of this jazz guitar article we changed a couple of things. 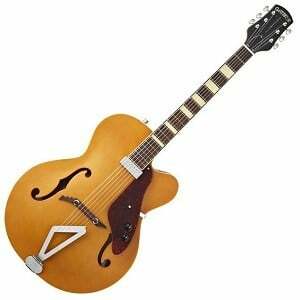 This included removing the Epiphone Broadway, which had become trickier to find, and adding two excellent jazz archtops – the Gretsch G100CE and the Godin 5th Avenue CW (Kingpin II). Anybody who has ever dabbled in jazz will know that it’s a style of music like no other – and a special kind of music deserves a special kind of guitar! Just like metal guitars or blues guitars are a breed of their own, jazz six-strings are a very specific bunch with unique audio, aesthetic and playability demands. Thankfully, a huge range of choices are open for jazz players, as today’s market is packed with many options – all vying for the title of ‘the best guitar for jazz’. We’ve broken things down for you by laying out a chart of the best jazz models as well as some buying advice to keep things simple. Let’s do it! The king of archtop jazz guitars? A North American-made archtop beauty. An easy playing semi-hollow guitar that’s perfect for jazz. Top-level mixture of high sound quality and top-level craftsmanship. Strong competitor for the best guitar for jazz race. A snazzy jazzy semi-hollow guitar from Swedish masters Hagstrom. A quality jazz guitar with a versatile bite. Gorgeous looks and INCREDIBLE versatility. The best jazz guitar for beginners. Gretsch are one of the kings of vintage-themed archtops and prove their skill with the wonderful G100CE Synchromatic Cutaway. With a design reminiscent of the early Synchromatic guitars of the 1940s, this instrument features a hollow body made entirely from laminated maple. Details such as the floating tortoiseshell pickguard, headstock and f-holes are nice touches to enhance the vintage feel of this guitar, while the 20-fret matte maple neck is incredibly playable. As we highlight in the complete review of the G100CE, it is limited to just a single pickup at the neck position, yet it offers a rich and full ‘jazz box’ tone, with mellow chords and smooth single notes. Well worth taking a closer look at this beautiful jazz guitar. The respected manufacturer Godin prove just how good the Canadian guitar industry is with this excellent North American-made archtop that’s perfect for jazz guitar. With a natural, burgundy, or delicious ‘Cognac Burst’ finish, this sleek hollow-bodied instrument is made entirely from Canadian wild cherry with a beautiful custom polished finish. Set into the body is a silver leaf maple neck, capped with a 21-fret rosewood fretboard. It’s fitted with twin P90s, which deliver a warm and smooth vintage-tinted sound for jazz. Extras such as the adjustable TUSQ bridge and very precise tuners make this an excellent instrument for the price. You can read more on the 5th Avenue CW in the full breakdown. Chinese brand The Loar have a big range of beautifully nostalgic revivals of guitars from yesteryear, and this LH-302T archtop is a real treat for jazz enthusiasts. It offers a beautiful mellow tone that comes courtesy of both the construction and pair of dogear P-90s. It features a thin 1.5” deep body made entirely of laminated maple, featuring a choice of two age-appropriate finishes. The mahogany neck has contemporary playability, with a thin C shape, padauk fretboard and 19 frets in total. As we have highlighted in the full review of the LH-302T, the hardware is excellent for the price, and includes a great set of TonePros Kluson tuners and floating tune-o-matic bridge. 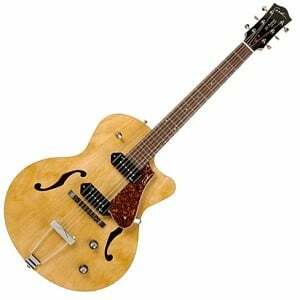 For most people, when they thing jazz guitars, they think archtop guitars, probably some vintage Gibson model. As much as their output may be focused on heavy rock and metal, Ibanez is very well-known for its jazz guitars – in particular, this delightful AM93QM Artcore Expressionist. 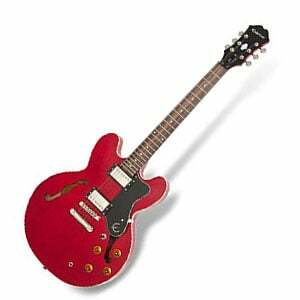 The Japanese brand make things easier for all players by keeping the dimensions of this double-cutaway semi-hollow model closer to your standard solid body guitar. 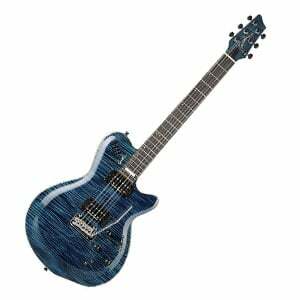 Ibanez also go all-out with elegant detailing and decoration, making this a joy to look at as well as play. The materials all stand up to scrutiny, with the top, back and sides made from laminated quilted maple, and a three-piece mahogany/maple neck. As we explain in the full Ibanez AM93QM review, this is fitted with some good hardware including a set of two vintage-inspired Super 58 Custom humbuckers. In the slightly more affordable region, the Epiphone DOT packs the budget-friendly version of the Gibson sound. For the listed price, this is a top-level mixture of high sound quality and top-level craftsmanship. The guitar utilizes a laminate maple body with a maple top combined with a sturdy mahogany neck with a standard rosewood fingerboard with 22 frets and white dot markers. In the electronic department, this puppy packs a pair of Alnico Classic Humbucker pickups mixed up with full-size 1-inch 500K ohm pots. The sound of this instrument is quite creamy and versatile. It is deeply rooted in jazz, of course, but a certain dose of grind and roar is always present in the mix, allowing you to crank this bad boy to hard rock and even metal according to some players. Yes, Ibanez is a company associated with the hard n’ heavy realm, BUT they actually have a surprisingly strong competitor for the best guitar for jazz race – the Artcore AF55. The sound is amazing and perfectly matches the smoky sonic vibe of the six-string. We are looking at plenty of audio boom here, secured by the mahogany hollow body. The rest of the mix also includes a strong mahogany neck with an attached rosewood fingerboard, a pack of 22 frets and classic white dot markers. Audio versatility is pretty high here, and the guitar is capable of tackling everything from light jazz tones to alternative rock groove. In the electronic region, an ACH-ST humbucker in the neck position and an ACH-ST humbucker in the bridge position reel in plenty of beefiness and resonance, a quiet signal with prominent middle frequencies. Played by everyone from Elvis Presley to Jimi Hendrix, Hagstrom guitars are a popular choice for all styles of guitarist, including jazz – especially with the Tremar Viking Deluxe, which is a modern reissue of the original Viking from the 1960s. 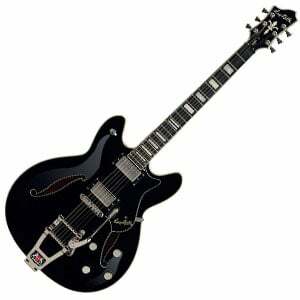 This elegant mid-range semi-hollow bodied guitar sports a sleek double-cutaway shape with a sophisticated glossy black finish. The Swedish brand use some quality materials to put it together, including laminated flamed maple for the body and Canadian hard maple for the 22-fret neck. It’s fitted with a duo of Hagstrom HJ-50 humbuckers, a superb Hagstrom Tremar Vibrato, and a set of distinctive tuners. There’s more on the cool Tremar Viking Deluxe in the complete roundup. Semi-hollows are an option of many jazz icons out there, and are known for finding their spot in the blues and rock ‘n’ roll domain as well. Their warm tone is highly prized, but it’s a more affordable pricing that also makes them stand out and gain a higher traffic share than archtops. We’ll sum up the good and the not so good things about this type of guitars in another rundown. Here goes! Jazz legends who play semi-hollow guitars: John Scofield, Mike Moreno, Emily Remler, Larry Carlton; not a jazz legend, but BB King’s Lucille is also a semi-hollow. When you’re looking for a solid-bodied jazz guitar that can also cope with pretty much anything else, Fender’s Mexican-made Classic Player Jazzmaster Special is a very good option – as we prove in the full review. First impressions are ‘traditional Jazzmaster’, with the distinctive relaxed body made of alder, two vintage-inspired color choices, the C-shaped maple neck, and the classic Fender headstock. 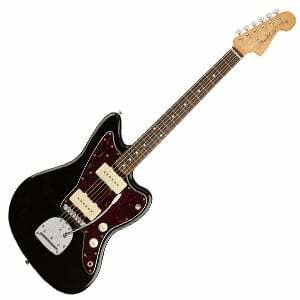 However, some modern upgrades make this a Jazzmaster that can adapt to suit any style. It’s loaded with two Special Design Hot Jazzmaster single-coil pickups which offer good warmth for jazz, but plenty of heat for rock, blues and many other genres. Along with the typical extensive Jazzmaster controls, it’s a very versatile model indeed. Now if you want a seriously strong solid body jazz guitar, something that could put you in the league with John McLaughlin in terms of tone (and not playing capabilities and musicality, mind you), the Godin LGXT is a valid pick. From the very moment you lay your eyes upon this instrument, you know that you are dealing with a pro-level device. The gorgeous looks, nothing but high-end components, the fee, the vibe, and INCREDIBLE versatility this thing has are bound to leave you speechless. No matter which style you’re looking to tackle, the Godin can handle it, and we thoroughly recommend every guitar player out there to give this fella a spin. The best solid-body guitar for jazz, hands down! In the super affordable section, we believe that Yamaha Pacifica is the best jazz guitar for beginners. It is a simple little newbie six-string that can be adapted to a variety of styles – which is a great feature for fresh players – but always has that extra pinch of jazz present in the mix. The instrument features an agathis body combined with a bolt-on maple neck, a sonokeling fretboard and a set of 22 frets with white dot markers. The hardware section is nicely spiced up with a vintage tremolo bridge, while the sound is driven by a pickup configuration of two humbuckers and one single-coil pickup. Tonal adjustments can be performed through Volume and Tone control knobs, as well as via 5-way toggle switch. For the listed price, this is a top-notch choice. Needless to say, this is a beginner guitar and you shouldn’t expect capabilities of a $2,000 axe. For those goods, proceed to the next models. Finally, solid body guitars are the third valid option we have. These things are basically what they call “standard” electric guitars, featuring a solid body driven by a mixture of tonewood and electronics. They are smaller, lighter, and highly versatile. So although while they don’t have that organic jazz sound, they can cover a lot of sonic ground and incorporate many musical styles. Let’s dive right into the good stuff – bad stuff part, shall we? Jazz legends who use solid body guitars: John McLaughlin, Al DiMeola, Allan Holdsworth, Mike Stern. That wraps it up folks! We hope you found some inspiration from our chart and managed to get a little closer to finding your best guitar for jazz. Now it’s simply a matter of reading some reviews, watching some videos and making a decision! 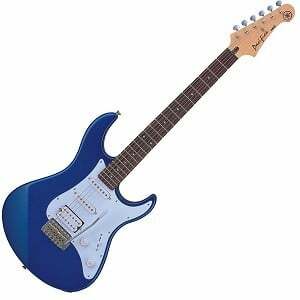 Don’t forget, if this is your first guitar, you’ll need to buy a good amplifier to go with it. If you liked our stuff, you can subscribe to our newsletter for more sensational guitar deals. The Godin 5th Ave. Kingpin series are excellent Jazz/Blue Archtop Guitars. P90 pickups, Canadian Wild Cherry and made in Canada. Starting with the Kingpin, the one I own, for $522.00 up to the Kingpin II for about $800.00 and the Kingpin Jazz for about $1500.00. Great guitars for the money.